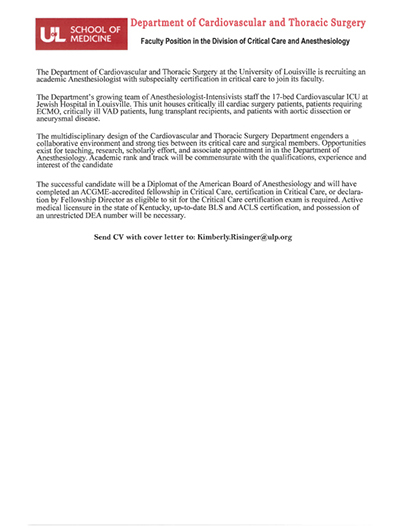 The Department of Cardiovascular and Thoracic Surgery at the University of Louisville is recruiting an academic Anesthesiologist with subspecialty certification in critical care to join its faculty. The Department’s growing team of Anesthesiologist-Intensivists staff the 17-bed Cardiovascular ICU at Jewish Hospital in Louisville. This unit houses critically ill cardiac surgery patients, patients requiring ECMO, critically ill VAD patients, lung transplant recipients, and patients with aortic dissection or aneurysmal disease.The multidisciplinary design of the Cardiovascular and Thoracic Surgery Department engenders a collaborative environment and strong ties between its critical care and surgical members. Opportunities exist for teaching, research, scholarly effort, and associate appointment in in the Department of Anesthesiology. Academic rank and track will be commensurate with the qualifications, experience and interest of the candidate. 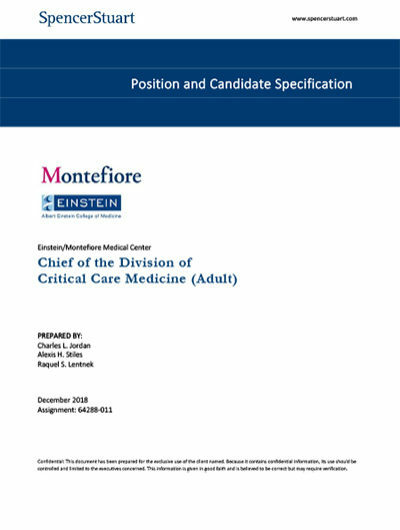 Montefiore and Einstein seek a physician-leader with a clear and unique vision, enthusiasm, and experience for the Chief, Division of Critical Care position. With overall responsibility for operations, finances, and strategy in Critical Care Medicine, the Chief will lead and grow the excellent clinical, research, and educational programs across the health system and College. The Chief will also oversee the continued development of centers of excellence and outstanding clinical programs and will support transformative research. 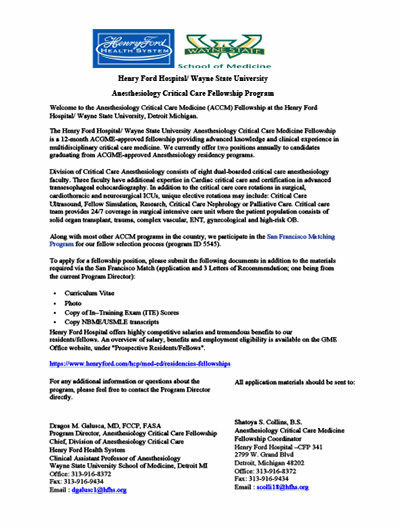 The Henry Ford Hospital/ Wayne State University Anesthesiology Critical Care Medicine Fellowship is a 12-month ACGME-approved fellowship providing advanced knowledge and clinical experience in multidisciplinary critical care medicine. We currently offer two positions annually to candidates graduating from ACGME-approved Anesthesiology residency programs. 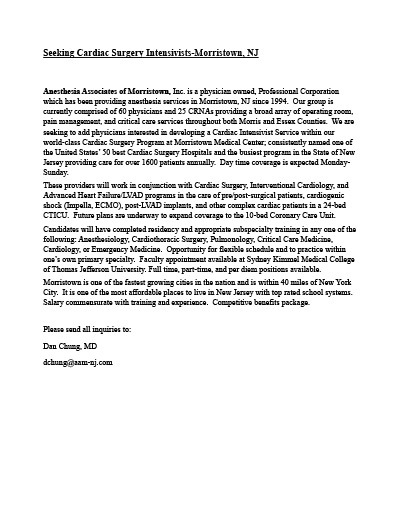 Faculty Position for Anesthesiology Critical Care. We are looking for an energetic physician who has completed a fellowship training in anesthesiology critical care and wants to join our dynamic ICU team. We are a group of currently 13 physicians and 21 advanced practice providers. All of our critical care fellows train in our ICUs, as well as interns, residents and various students (medicine, PA, NP, paramedics). OHSU is a 550-bed Magnet hospital with level-1trauma designation and the only academic hospital in Oregon. 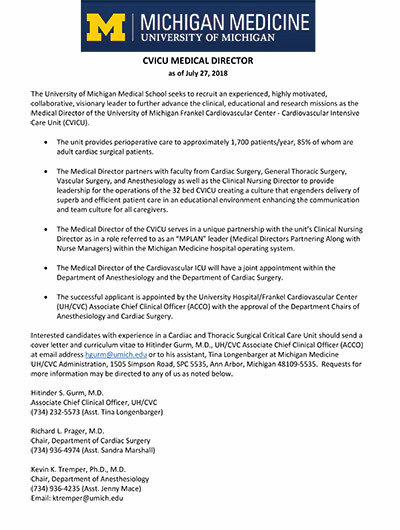 collaborative, visionary leader to further advance the clinical, educational and research missions as the Medical Director of the University of Michigan Frankel Cardiovascular Center – Cardiovascular Intensive Care Unit (CVICU). Kevin K. Tremper, Ph.D., M.D. , ktremper@umich.edu or call (734) 936-4235 (Asst. Jenny Mace). Anesthesia Associates of Morristown, Inc. is a physician owned, Professional Corporation which has been providing anesthesia services in Morristown, NJ since 1994. Our group is currently comprised of 60 physicians and 25 CRNAs providing a broad array of operating room, pain management, and critical care services throughout both Morris and Essex Counties. We are seeking to add physicians interested in developing a Cardiac Intensivist Service within our world-class Cardiac Surgery Program at Morristown Medical Center. Mercy Medical Group, a large multi-specialty practice, is seeking an Intensivist to care for pre/post-surgical, cardiogenic shock, post-LVAD implant and other complex cardiac patients in the Cardiac Surgery ICU at Mercy General Hospital. Shift based model in collaborative, team-oriented environment with one of the busiest cardiac surgery programs in CA. Shareholder track opportunity. 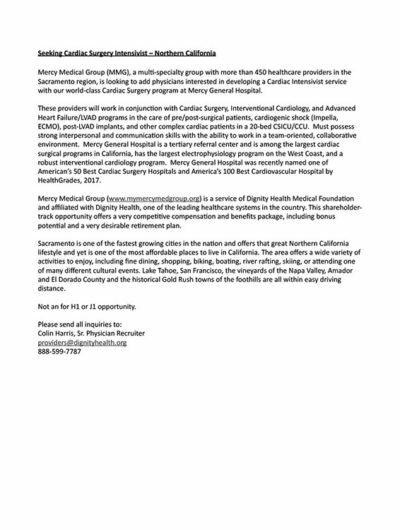 Our multi-specialty group with more than 450 healthcare providers in the Sacramento region is looking to add physicians interested in developing a Cardiac Intensivist service with our world-class Cardiac Surgery program. These providers will work in conjunction with Cardiac Surgery in the care of pre/post-surgical patients in a 20-bed CSICU and CCU. Must possess strong interpersonal and communication skills with the ability to work in a team-oriented, collaborative environment. This team will work in direct support of the Dignity Health Heart and Vascular Institute. Our system is one of the busiest Cardiac programs in CA and nationally recognized leader in Cardiovascular services. 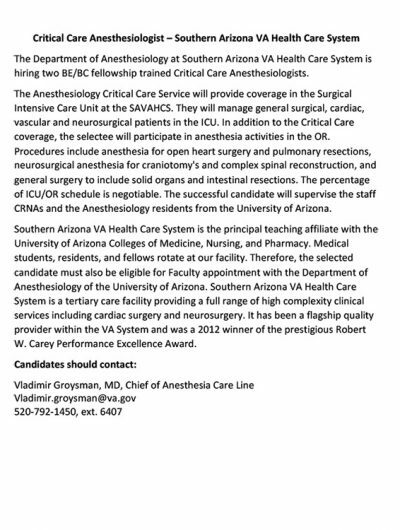 The Department of Anesthesiology at Southern Arizona VA Health Care System is hiring two BE/BC fellowship trained Critical Care Anesthesiologists. The Anesthesiology Critical Care Service will provide coverage in the Surgical Intensive Care Unit at the SAVAHCS. They will manage general surgical, cardiac, vascular and neurosurgical patients in the ICU. In addition to the Critical Care coverage, the selectee will participate in anesthesia activities in the OR. Procedures include anesthesia for open heart surgery and pulmonary resections, neurosurgical anesthesia for craniotomy’s and complex spinal reconstruction, and general surgery to include solid organs and intestinal resections. The percentage of ICU/OR schedule is negotiable. The successful candidate will supervise the staff CRNAs and the Anesthesiology residents from the University of Arizona. 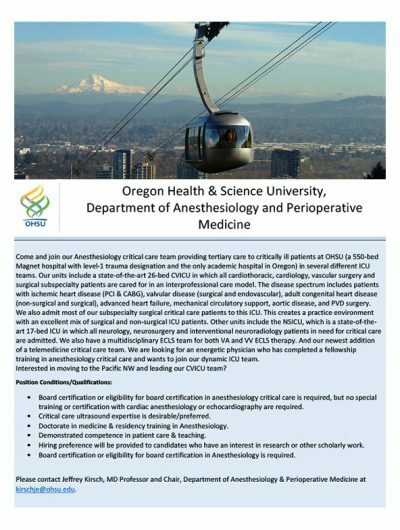 The Department of Anesthesiology & Perioperative Medicine at the Oregon Health & Science University (OSHU) has full-time opportunity. 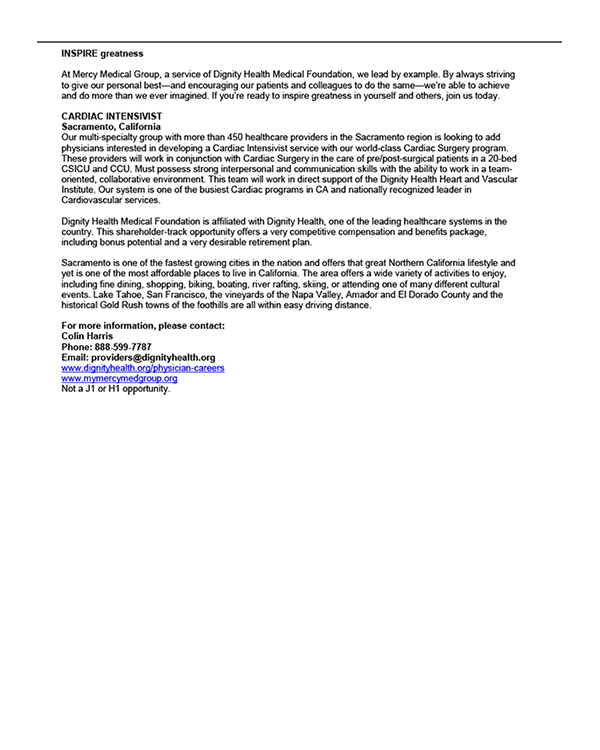 OHSU is looking for an energetic physician who has completed a fellowship training in anesthesiology critical care and wants to join OHSU ICU team. Board certification or eligibility for board certification in anesthesiology critical care is required, but no special training or certification with cardiac anesthesiology or echocardiography are required. Critical care ultrasound expertise is desirable/preferred. 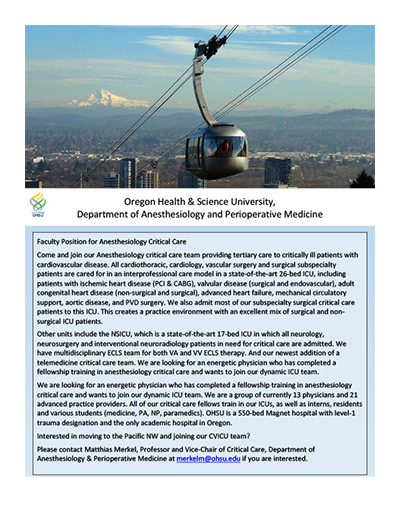 Please contact Jeffrey Kirsch, MD Professor and Chair, Department of Anesthesiology & Perioperative Medicine at kirschje@ohsu.edu. Faculty Anesthesiologist and Intensivist positon. 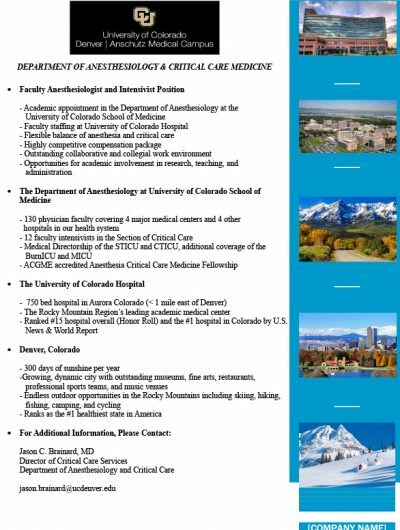 Academic appointment in the Department of Anesthesiology at the University of Colorado School of Medicine. Faculty staffing at University of Colorado Hospital. 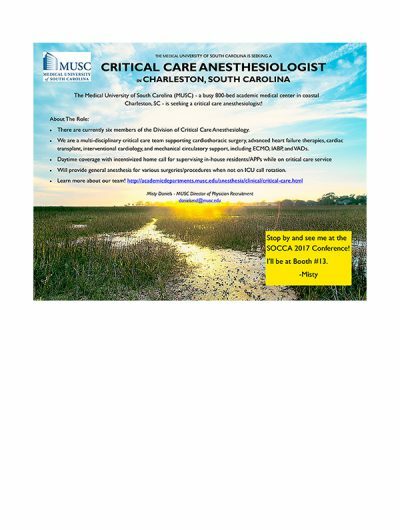 Flexible balance of anesthesia and critical care. Highly competitive compensation package. Outstanding collaborative and collegial work environment. Opportunities for academic involvement in research, teaching, and administration. 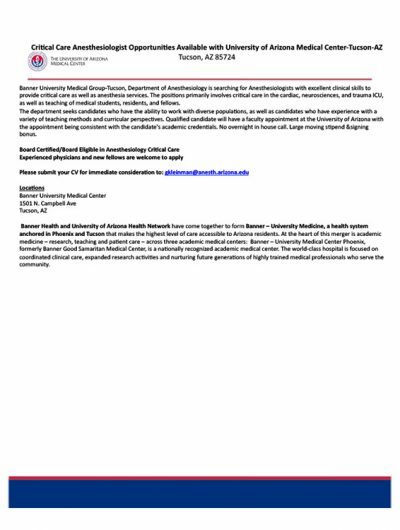 Banner University Medical Group-Tucson, Department of Anesthesiology is searching for Anesthesiologists with excellent clinical skills to provide critical care as well as anesthesia services. The positions primarily involves critical care in the cardiac, neurosciences, and trauma ICU, as well as teaching of medical students, residents, and fellows. The department seeks candidates who have the ability to work with diverse populations, as well as candidates who have experience with a variety of teaching methods and curricular perspectives. Qualified candidate will have a faculty appointment at the University of Arizona with the appointment being consistent with the candidate’s academic credentials. No overnight in house call. Large moving stipend & signing bonus. Submit CV for immediate consideration to: gkleinman@anesth.arizona.edu. 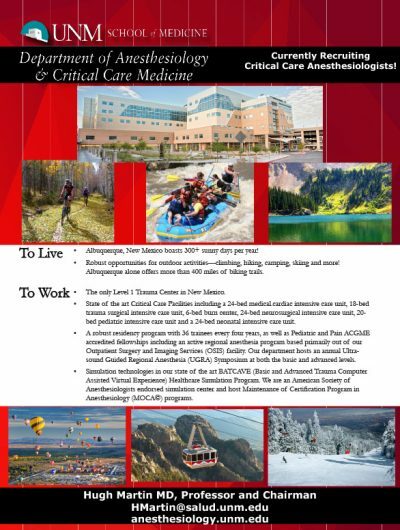 Currently recruiting Critical Care Anesthesiologist. The only Level 1 Trauma Center in New Mexico. State of the art Critical Care Facilities including a 24-bed medical cardiac intensive care unit. A robust residency program with 36 trainees every four years, as well as Pediatric and Pain ACGME accredited fellowships. See flyer for more details. 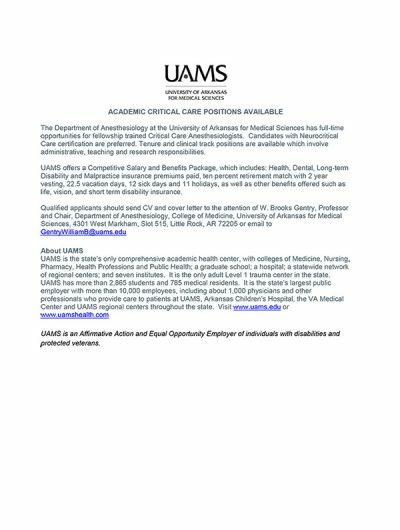 The Department of Anesthesiology at the University of Arkansas for Medical Sciences has full-time opportunities for fellowship trained Critical Care Anesthesiologists. Candidates with Neurocritical Care certification are preferred. Tenure and clinical track positions are available which involve administrative, teaching and research responsibilities. 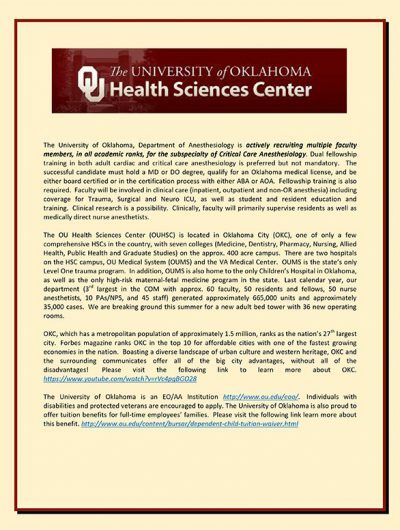 The University of Oklahoma, Department of Anesthesiology is actively recruiting multiple faculty members, in all academic ranks, for the subspecialty of Critical Care Anesthesiology. Dual fellowship training in both adult cardiac and critical care anesthesiology is preferred but not mandatory. The successful candidate must hold a MD or DO degree, qualify for an Oklahoma medical license, and be either board certified or in the certification process with either ABA or AOA. Fellowship training is also required. Faculty will be involved in clinical care (inpatient, outpatient and non-OR anesthesia) including coverage for Trauma, Surgical and Neuro ICU, as well as student and resident education and training. Clinical research is a possibility. Clinically, faculty will primarily supervise residents as well as medically direct nurse anesthetists.